Since it debuted not quite 40 years ago, “Star Wars” has held a special place in my childhood-stunted heart. I can remember my mother, who was not exactly what you would call an avid fan of pop culture much less science fiction, telling me that she heard of this movie that I might like to go see. For a kid of the ‘60s and ‘70s, these shows represented the best that Hollywood had to offer in the way of production values and special effects. 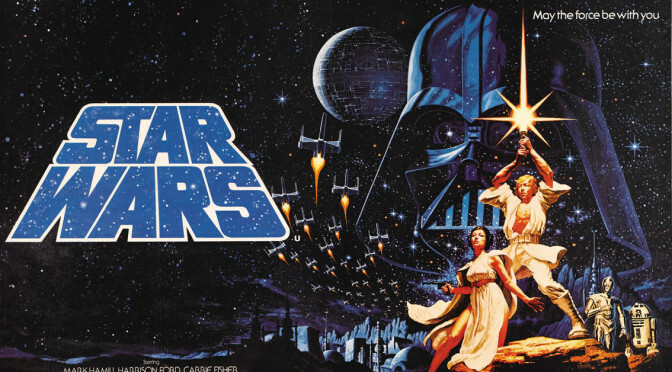 So when I saw a clip of “Star Wars” on the morning news in 1977, I was gobsmacked. The blasters! The droids! The Millennium Falcon! My mom took me to the Loews movie theater on East 86th Street in Manhattan to see it. As childhood milestones go, seeing “Star Wars” for the first time ranked up there with getting a G.I. Joe Mobile Support Unit when I was 8. In other words, this was a really, really big deal. Overnight, I became a “Star Wars” geek. Trading cards from both Topps AND Wonder Bread? I had many, many posters and I was hellbent to display all of them except that I quickly ran out of wall space on my side of the room, which I shared with my two sisters. And there was no convincing my sisters to part with some of their precious wall space. My bed had a headboard. It was attached to the bed frame by two wooden uprights and the headboard itself was large, white and padded. This headboard took up valuable real estate, aka wall space. So obviously, it had to go to make way for my “Star Wars” posters. One night – I think my parents were out – I did what any enterprising 12-year-old would do: I got out a hand saw and cut the headboard off. Voila! More wall space! Problem solved! Except, of course, what I did not anticipate was that the headboard was, in fact, keeping the entire bed frame together. Without it, the mattress rested on the equivalent of two stilts. All of this comes to mind as “The Force Awakens” – the much-anticipated seventh installment in the “Star Wars” franchise – opens this week. I’ve already bought my tickets in advance. I’ve got my “Star Wars” tie ready to wear and I’m looking to buy movie memorabilia and merchandise. Pretty soon the house will be overrun with all kinds of “Star Wars” goodness. You know, the bedroom set I have now has a wooden headboard.